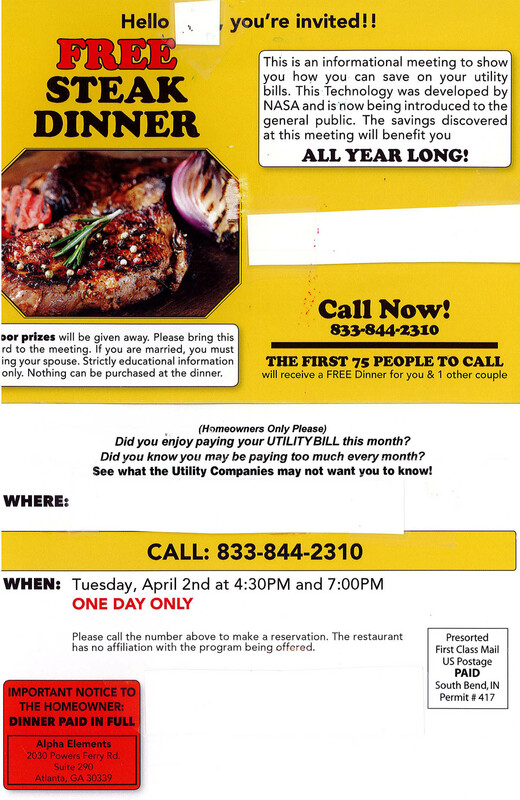 You may have received a postcard in the mail offering a free dinner for you and your spouse at a local restaurant . The postcard is an invitation to a seminar claiming to be about energy efficiency. Please be aware this company is not endorsed by Fort Loudoun Electric Cooperative or TVA or associated in any way. Alpha Elements is a business based in Atlanta, GA specializing in selling their services for home energy efficiency improvements. The services offered by them may be effective. However, the postcard also claims Alpha Elements will be presenting information your utility company may not want you to know. FLEC and TVA continue to promote energy efficiency for all of our members and always want you to make the most of your energy dollars. TVA’s eScore program offers valuable information about energy savings, as well as local contractors for you to choose from. You can access more information by visiting www.2eScore.com or by calling 1-855-2eScore. Again, FLEC does not endorse this company or their services. Please contact Fort Loudoun Electric Cooperative (877-353-2674) if you have any questions or concerns.